You have open your old gmail after long time? I’m sure it is filled loads and loads of Spam and junk mails. Clearing all these unwanted mails in gmail is huge task. 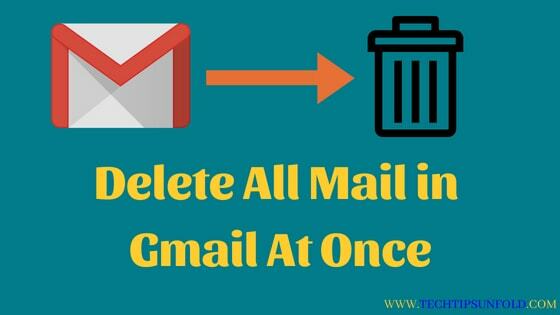 But if you follow these simple tricks, you can Delete all Mail in Gmail in an easy way. Conventional way we follow to delete all mails in gmail is, select all the mails on one page and delete them. Navigate to second page and delete those mail and so on. This would be pretty difficult if you have your inbox filled with huge number of emails. Once 50 conversations are selected, beside to ‘All 50 conversations on this page are selected‘, you will find ‘Select all 388 conversations in Primary‘ option. You don’t have any mail! Our servers are feeling unloved. Once you followed all these steps, all your mail will be moved to Trash. They will not be permanently deleted. If you wish to delete them permanently, Follow the below steps. In some cases, you just wanted to delete only unread mails instead of all mail in gmail. In such case, this method will be useful. This way is similar to ‘Delete all mail in Gmail’. Follow the below steps to do it. Now you will find options like All, None, Read, Unread, Starred, Unstarred etc. To delete them permanently, Go to trash and click on Empty trash option. If you are getting too many spam emails and you want to delete all the mail from that particular Gmail ID, you can follow these simple steps. You can combine label to utilise advanced search options with Gmail. You even combine multiple labels and drill down to the lowest levels possible. For example, if you want to delete all the mails from a particular id in inbox that you’ve already read etc. Follow the below steps to achieve this. Do you know? You can even do this in gmail. You need to find out all the mails which are having attachments and them filter them with size greater than 5 MB. Let’s check it out how. So this is the complete guide on How to Delete all Mail in Gmail. If you have any queries regarding this or facing any issues deleting emails in gmail, Let us know. We will be glad to help you. Cheers! Great tips! I found some really useful for me. Thanks for sharing!